Massive, the company I have been so busy at over the last 22 years was sold a few months back. This is an amazing milestone. It’s rare to have a job that you love to go to every day. In my role as the person who solves the new and technically hard stuff in a user experience centric manner, I get to work on the most amazing technologies with the most creative people in the world. Hope you have all been following the success of my son’s game. He’s currently close to releasing ‘skinning’ which was inspired by some fan art submitted about the game. You can purchase it on Steam for US$3. It’s a bargain. As a side project, I’m turning the game’s core networking engine into a separate project and product. It’s been evolving over the last few years into my main side project, mainly as a way to save hosting costs and distribute load for his game. People who knew me from back when I was working on MetaWrap kept drawing my attention to the last season of Silicon Valley as their ‘new internet’ is similar to what I was talking about many years ago. The distributed object model that MetaWrap exposed to the world was always imagined as a ‘free’, consistent and more useful version of the internet developed over the top of the existing one. While working on the game networking engine I kept being drawn back to the old ideas and solutions I came up back then that solved the same problems, so it’s merged with the goals of my old vision of a distributed decentralised internet. I’ll definitely be posting more about this in the future. I’m resurrecting my cellular automata physics game. I sank years into Hex, only to have Microsoft abandon XNA. This made me down tools for a while. I’ve been working on the networking technology required to run such a massive world in the meantime and been testing it on my son’s game. I’ve done so much in Unity over the last 5 years helping my son with his game that I feel confident in using Unity starting Hex up again. Luckily I designed it with many layers of abstraction and Unity also uses C#, so this will be more of a port than a re-write. More progress on the CA physics engine. Collisions now seem to be working reliability with a conservation of momentum that is accurate (enough) and visually pleasing. Now experimenting with dispersion and forces. I have a basic orbit working and gas of sorts. Still trying to close the loop between mass causing gravity, at the moment with this latest version, gravity is hard coded in as I try and get dispersion, momentum and acceleration to not trip over each other. I’m now starting the 4th and final version of the physics engine… getting the flow right.. The Venn diagram for Efficient, Fun and Realistic is harsh. 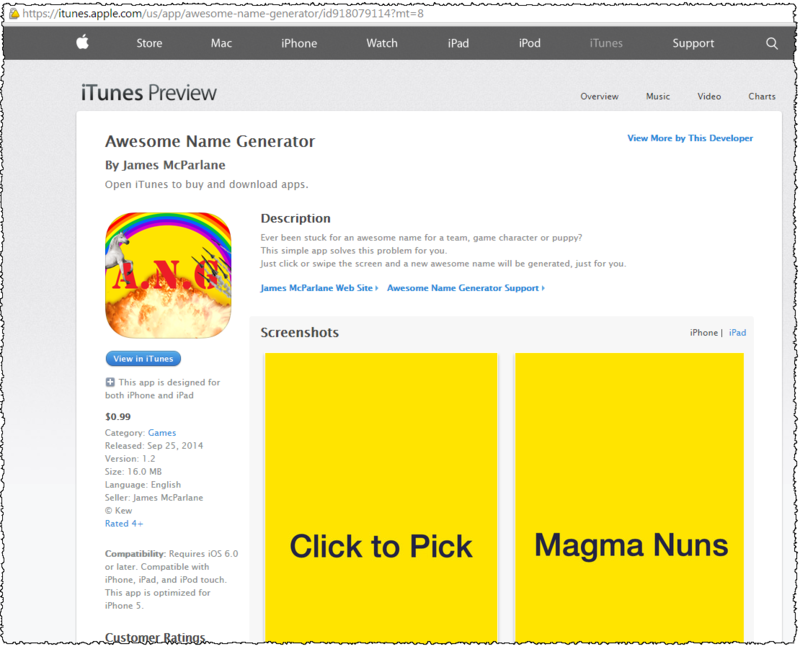 My son has ported his Awesome Name Generator Android app to iPhone and iPad and released it onto the iTunes Store. Been back to The Game’s core engine for the last few months on and off. The tutorial engine, which can be used to multimedia enable Twine stories, is now feature complete. Slowly working towards a Kickstarter project with one story author to publish their game using just the tutorial engine. I’m also considering Kickstarting the tutorial engine itself as a separate spin off. The aim being to fund it to get developed to the level of a stand-alone tool as well as a port to Unity. As for The Game, at this point I’m working on the world physics. In the last few months I have managed to make progress with…. Visualisation of the World Hexagons. Navigation/Focus throughout the World Hexagons. (Mouse, keyboard and game controller). Basic Gas physics (with thermodynamics). In the demo video below, I scroll around a bit while I simulate a 100kg ball of a 100K ideal gas being released in the vacuum of space. The gas expands until it reaches pressure equilibrium with a cohesive force holding the gas together. 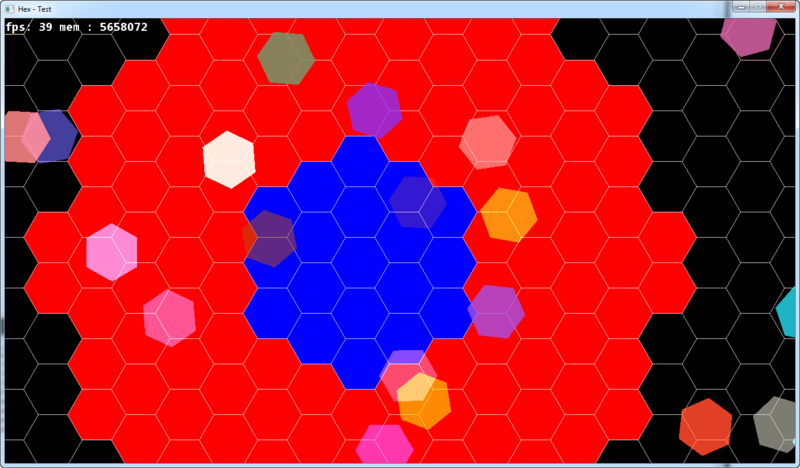 I’m using a time scalable cellular automata send force messages between hexagons. That way I can build up force tensors slowly. I’m aiming at being able to round-robin timeslice the physics updates. The colors I use don’t represent the relative temperature, more how temperature is changing over time. Red = heating, Blue = cooling, and Green = stable. You will see it eventually turn green as it stabilises. What happens before that is rather hypnotic, particularly just before equilibrium where solitons seem to form. Working on performance and basic data flow at the moment (because getting the data flow correct is really important). Happy so far. The physics is running hundreds of times faster than I need. Next steps are to tidy up some of the navigation and simulate gravity in some form. I’m thinking of extending the cellular automata approach to get the cells to explore and agree upon a stable curvature of space based on distribution of mass within it. This should create something very gravity like. Not totally realistic, but gamey enough for things to fall to planets. Gas velocity will be tricky, but I wants it. I’m experimenting with moving the physics between different levels of cellular detail based on how how uniform the force vectors are. 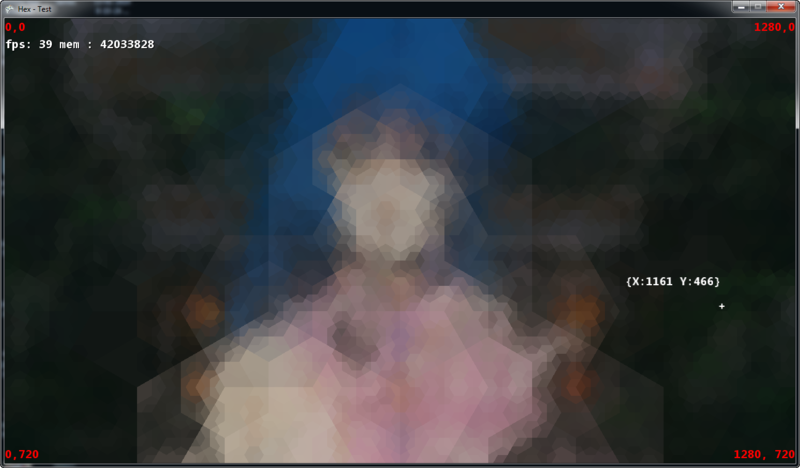 This is similar to how I distributed detail in my hexagon image and video encoding. I will be need to do a decent visualisation of this at some point. It may be a dead end but it should allow the realism to naturally scale based on what is visible and where it is needed.